I’d just got back from the last cross country race of the season (not exactly a triumphant end to the season – we got lost and went for a spot of urban rather than cross country running trying to find start) and was rather cold and muddy and in need of something comforting to warm me up. I avoided the allure of hot chocolate and instead put the lentils on to boil and the veg to sweat whilst I got in the shower and had a tasty soup pretty much ready and waiting for me by the time I’d got dressed. I cooked the lentils in water with good dollop of Marmite, packed with B vitamins. If you’re not a Marmite fan you can use a stock cube. In a separate pan sweat down the onion and carrots, when the carrots begin to soften add in the courgette and red pepper. Once they’re all getting soft add them in to the cooked lentils (you shouldn’t need to drain the lentils, just keep an eye on the water when you’re cooking the lentils), add a bit more water if needed, or a can of tomatoes, and serve with some fresh crusty bread. 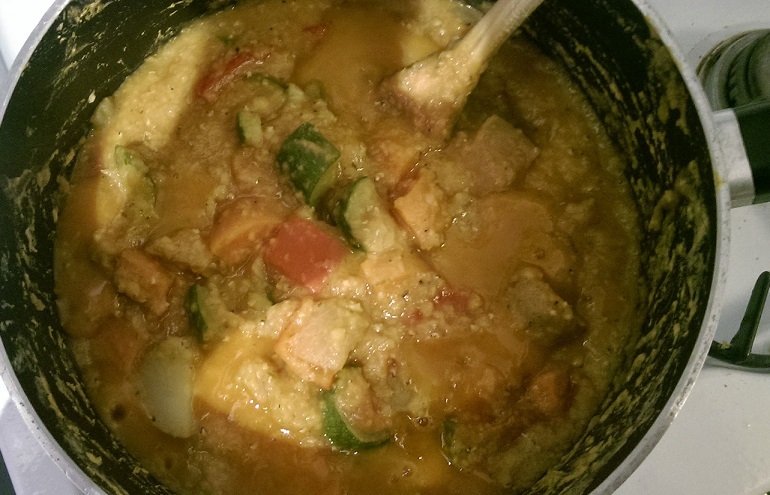 This entry was posted in health, recipe and tagged health, lose weight, vegetarian recipe, veggie protein. Bookmark the permalink.